For years, I played the pro circuit without having a feel for the short game. Then one day, I turned things around - not by hitting balls but by tossing them. For an entire day I tossed golf balls, from a variety of positions and to a variety of targets. I must have tossed over 500 of them, carefully noting the way each ball reacted after it hit the green. That was the day I learned the meaning of touch. I recommend this exercise to you, whether you have a good short game or not. Take a dozen or so balls and toss them, underhanded, all toward the same target. Cup each ball in the palm of your hand and toss it with a stiff-wristed motion. This will give you a feel for the properly firm wrist action in chipping. 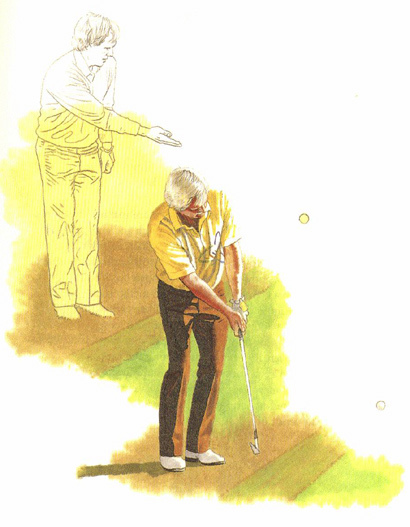 Toss high balls that fly all the way to the hole and sit, and others that roll almost like putts. Make some downhill and uphill tosses as well, to see which type trajectory and roll works best in which situations. I suspect you'll find, as I did, that the 'low road' is easiest to regulate, whether you're tossing a ball with your hand or chipping it with a golf club. Above all, however, you'll gain an understanding of the intricacies of the short game, where imagination and innovation are paramount.